Enjoy every steak a little bit more with a precision serrated steak knife that ensures you slice through each bite with ease. When it comes to steak, getting to the juicy center is challenging if you have dull or basic steak knives that don't slice perfect portions; making even the most tender of meats a challenge to enjoy. That's why we created the Mozzbi Steak Knives Set; a precision-designed serrated knife set that offers better cutting power, reliability, and ultra-sharpness you just won't find with a generic brand. Each blade is crafted from German steel to ensure strength and long-lasting durability. The handles are also triple-riveted over the solid steel to give a better ergonomic grip, stronger leverage, and better reliability. These serrated blade steak knives are great for thick meats, poultry, cheese and bread. They're also rust-resistant and dishwasher safe, but we do recommend handwashing them to help retain long-term usability. 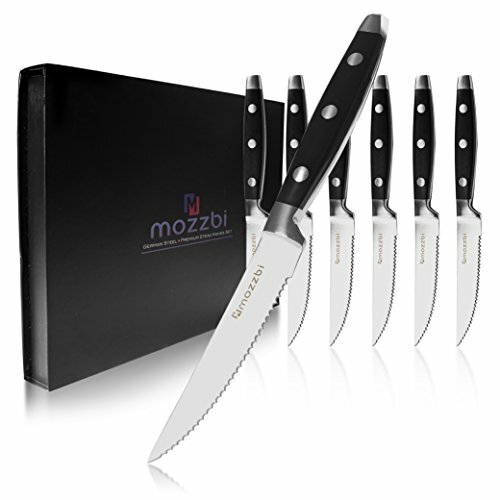 Click 'Add to Cart' to get your premium-quality Mozzbi Steak Knives and add a little practical style and sophistication to every meal. If you have any questions about this product by Mozzbi, contact us by completing and submitting the form below. If you are looking for a specif part number, please include it with your message.